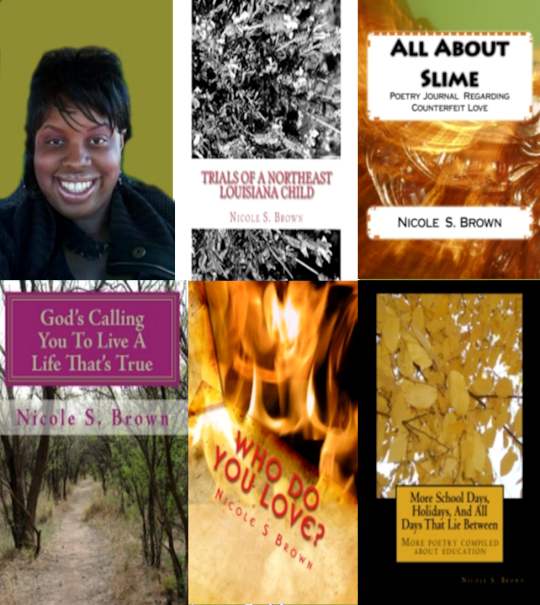 Nicole S. Brown is the founder, owner and operator of Poetry at Best located in Baton Rouge, LA. It also has locations in Monroe, LA, and Vicksburg, MS. Nicole is the author of School Days, Holidays, and All Days That Lie Between (ISBN: 1449560954), More School Days, Holidays, and All Days That Lie Between (ISBN: 1449983952), Who Do You Love? Love Story in Poetry (ISBN: 1450549322), Who Do You Love? Love Story in Poetry (clean cut) (ISBN: 1451534981), God’s Calling You to Live a Life That’s True (ISBN: 1449549829), All About Slime (ISBN: 1448699290), All About Slime (clean cut) (ISBN: 145634711X), Trials of a Northeast Louisiana Child (ISBN: 144956609X), her first novella, The School of Hard Knocks (ISBN: 1460903579), and Life Support (ISBN: 1467945277), and The Refusal to Return to Slime (ISBN:1497478561) . The books have 4.5 to 5 star reviews. Nicole, a native of Monroe, LA, is the youngest of seven children, and was formally educated in Monroe, LA. Nicole is a Louisiana- Mississippi certified, K-12 teacher who holds certifications in the following subject areas: Chemistry, Physics, General Science, and Music. She is also a member of Zeta Phi Beta, Sorority Inc. She holds a B.S., in Chemistry Education from the University of Louisiana-Monroe. Nicole worked as an elementary general music teacher for two years in Baton Rouge, LA, in her second year in Baton Rouge; she wrote and published seven books of poetry.